The Sandpoint café now offers an expanded menu and a wine bar. Some folks may still remember when Coldwater Creek had its swanky retail outlet inside Sandpoint's Cedar Street Bridge. Or when new owners reopened it in 2007 with the idea of transforming it into a mixed-use shopping and dining space. Since 2008, the Cedar Street Bistro has been a steadfast ground-floor tenant. 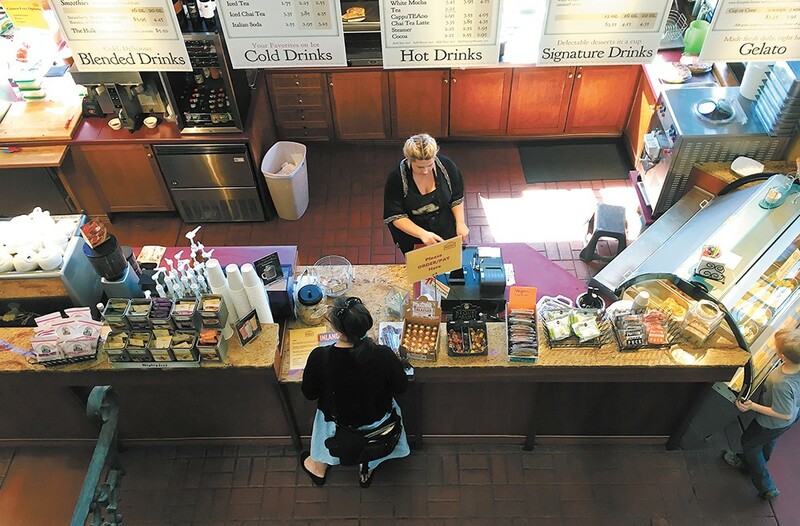 Owners Manuela and Tim Frazier opened their modest café just inside the entrance of the Bridge, offering coffee and espresso, Manuela's home-baked goods, as well as local pastries and grilled paninis. It seems like every visit comes with more additions: gelato, more sandwiches, crepes, pizza, and the Huckleberry Depot, which sells packaged and dry goods. As the bistro's menu expanded, so did its following and footprint, including a partitioned seating area along the large windows overlooking Sand Creek. Most recently, the Fraziers added a wine bar, live music, a revamped retail section and a menu that will carry you from breakfast to dinner — quiche and coffee, soup and a chicken basil crepe, grilled Mediterranean wrap and a glass of merlot. And don't forget about dessert.